Buying a Christmas gift for friends or relatives in their bonus years can be a challenge. For example, what kind of gift do you buy for the bonus years empty-nester who is already downsizing? What do you get people who have arrived at that point in their life where they have “stuff” everywhere and are now packaging old (but perfectly good) clothing to be picked up by AmVets – or passing on furniture, appliances, tableware and pots and pans to adult children, young neighbors or Goodwill? Or, what do you get later-life friends who have gone down to the sea to retire to a life as liveaboards on a boat, where finding room even for the necessities of life is a challenge? Or those who have leased or purchased a Winnebago or another RV brand to “see America first,” as the old slogan used to say. Like many others, we were once challenged to find appropriate gifts for our parents who already seemed to have everything. Then, during a visit to Green Bay, Wisconsin one Thanksgiving nearly 30 years ago, I was fretting out loud about this to my late father-in-law, Bernie Waldkirch. Bernie – a delightful father of nine children and a family physician who worked late into his bonus years – was content reading, visiting with friends, volunteering, gardening and having his family around. Bernie loved seven-year-old Wisconsin cheddar cheese, so now I could get him cheese, which would surely bring a huge smile to his face. He was a hunter, so I could get him shells for his shotgun and dog food for Sniffer, his hunting dog. He loved orange marmalade, so now we could buy him a crock of Hartley’s Olde English Thick Cut Marmalade, which he would position squarely in the middle of the breakfast table, one of few instances he was slow to share. 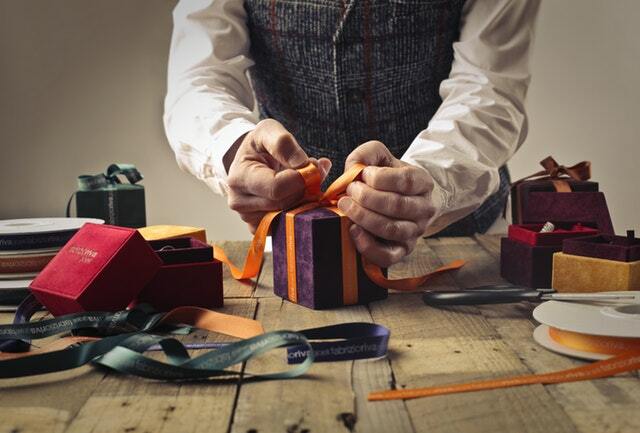 Once he introduced us to the new idea of gifting “consumables,” it sparked our imagination and brought new delight to Christmas shopping – and birthdays and other special occasions. Consumables, to my way of thinking, are a step up from “expressions” – e.g., flowers (“Say it with flowers”) or greeting cards (“When you care enough to send the very best”). I say “step up” because consumables make room for a lot more imagination. Think of a subscription to a favorite newspaper or magazine – such as The Atlantic Monthly, The Economist or National Geographic – or The Capital. Each is an experience gift. I would also suggest a good book, but my wife frowns on that. It’s her view that books, once read and not given away, become stuff. I view books as “forever friends” – to be read and then stored on a bookshelf as living memories of a good experience. Think of an entertainment gift – such as a year’s subscription to Netflix or Roku or one or more premium channels on cable TV – such as HBO or pay-per-view sports. What about a pass to their favorite movie theater, a season subscription to the local symphony or another of the performing arts? Think digital. What about an e-reader – such as an Amazon Kindle or a Nook from Barnes & Noble – so a senior can read newspapers, magazines and books on a screen where they can enlarge the font as their visual acuity declines. The e-reader also helps with de-cluttering by replacing space-hogging books and dust-collecting encyclopedias with space-saving digital substitutes. What about a Samsung Play or iTunes debit card so that bonus years relatives can buy apps for their Android or iPhone – or a pass to attend “how-to” workshops to learn how to take their computer use beyond email and browsing the Internet to applications such as Facetime so they can talk toll-free and face-to-face in real time with their grandchildren, no matter how far away they might live. Or photography? Or games? Indeed, the domain of “experience gifts” leads to an expanded world of gifting that we often ignore. Consider up-budget examples: The gift of an airline ticket to older parents so they can come see their grandkids. Gifting experiences can also work the other way. Example: Parents in their bonus years may gift a holiday for their adult children and grandchildren on a Gulf coast or South Carolina beach where the entire family might assemble for a week to enjoy each other, share experiences and relax. For a bonus years couple on a tight budget or still shedding stuff, there are all kinds of possibilities. In one case we know, senior parents, preparing to move to a smaller home, gave each of several grown children, nephews and nieces a call on furniture, silverware, art work and other valuables, using a lottery-type approach – and made a party of it. In another case, a neighbor devoted a day a week using his computer and digital photography technologies to create customized family histories with pictures tailored to the interests of each grandchild. Creating the digital album gets easier every year with photo book sites like Shutterfly and Moleskine. There’s also Mosaic, a photo book app for iPhone photos, which helps you create a photo book from your Instagram or Facebook posts. Younger ones can also gift experiences. In my wife’s family, the nine adult children, instead of gathering, all at one time, on mom’s/grandmother’s birthday, decided to spread the birthday visits throughout the year – one family per month. Another we know gives elderly parents “vouchers” or chits for raking the yard, cleaning the basement, washing windows, mowing the yard and other services that senior parents need, can no longer perform themselves but might hesitate to ask their adult children to do. Then, of course, there are personal services gifts such as a pre-paid pass to the hair salon, the local spa or another indulgence that will be appreciated. Honor and love are often expressed by gifts. To paraphrase the late Lebanese-American writer and poet, Kahlil Gibran, “Gifts are love made visible” – especially gifts of experience and engagement, not stuff, whatever the age, whatever the season. Share the post "Gifts of ‘engagement’ and ‘experience’ are hard to beat"